1,996 miles in 10 days. 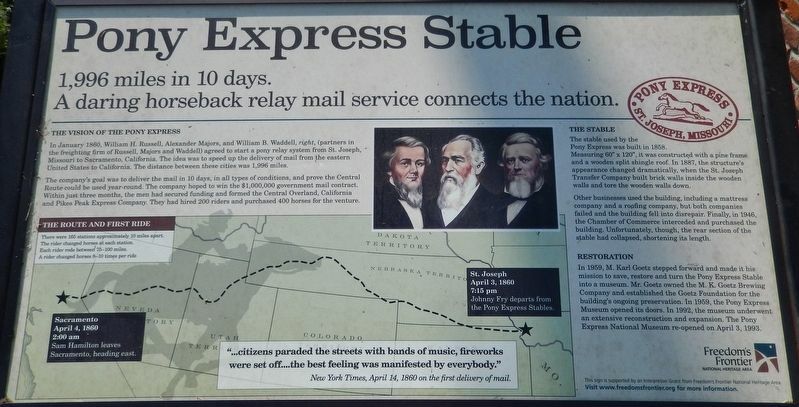 A daring horseback relay mail service connects the nation. In January 1860. William H. Russell, Alexander Majors, and William B. Waddell, right, (partners in the freighting firm of Russell, Majors and Waddell) agreed to start a pony relay system from St. Joseph, Missouri to Sacramento, California. The idea was to speed up the delivery of mail from the eastern United States to California. The distance between these cities was 1,996 miles. The company's goal was to deliver the mail in 10 days, in all types of conditions, and prove the Central Route could be used year-round. The company hoped to win the $1,000,000 government mail contract. 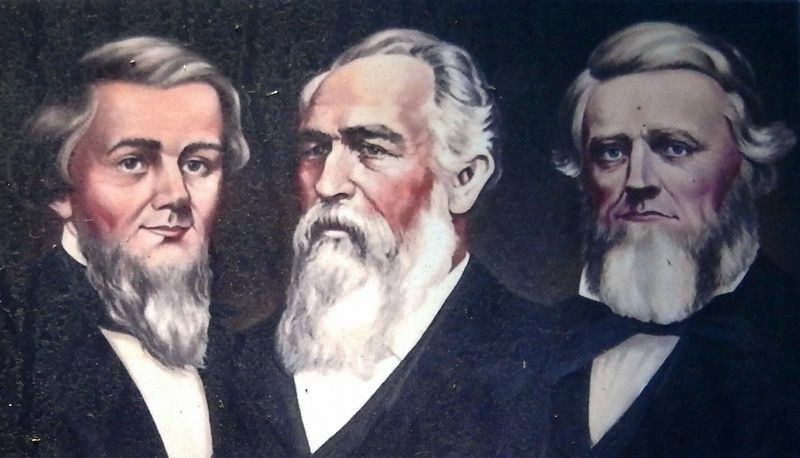 Within just three months, the men had secured funding and formed the Central Overland, California and Pikes Peak Express Company. They had hired 200 riders and purchased 400 horses for the venture. Johnny Fry departs from these Pony Express Stables. Sam Hamilton leaves Sacramento, heading east. New York Times, April 14, 1860 on the first delivery of mail. 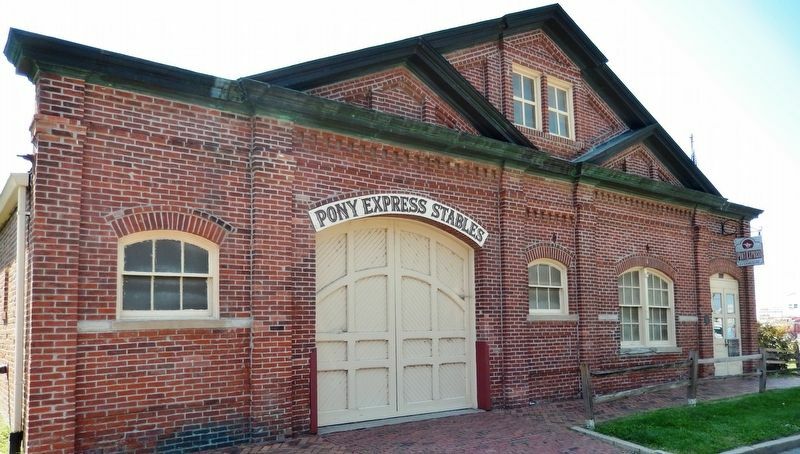 The stable used by the Pony Express was built in 1858. Measuring 60" x 120", it was constructed with a pine frame and a wooden split shingle roof. 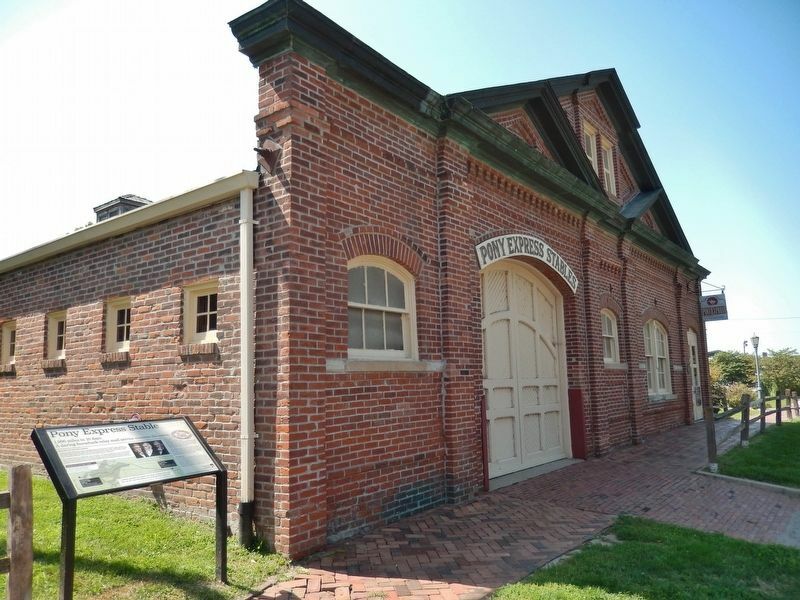 In 1887, the structure's appearance changed dramatically, when the St. Joseph Transfer Company built brick walls inside the wooden walls and tore the wooden walls down. Other businesses used the building, including a mattress company and a roofing company, but both companies failed and the building fell into disrepair. Finally, in 1946, the Chamber of Commerce interceded and purchased the building. Unfortunately, though, the rear section of the stable had collapsed, shortening its length. preservation. In 1959, the Pony Express Museum opened its doors. In 1992, the museum underwent an extensive reconstruction and expansion. 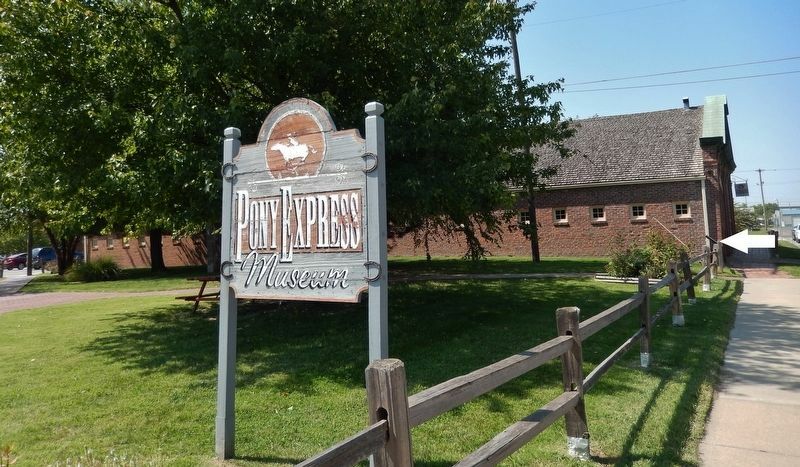 The Pony Express National Museum re-opened on April 3, 1993. This sign is supported by an Interpretive Grant from Freedom's Frontier National Heritage Area. Visit www.freedomsfrontier.org for more information. Erected by Freedom's Frontier National Heritage Area. Marker series. 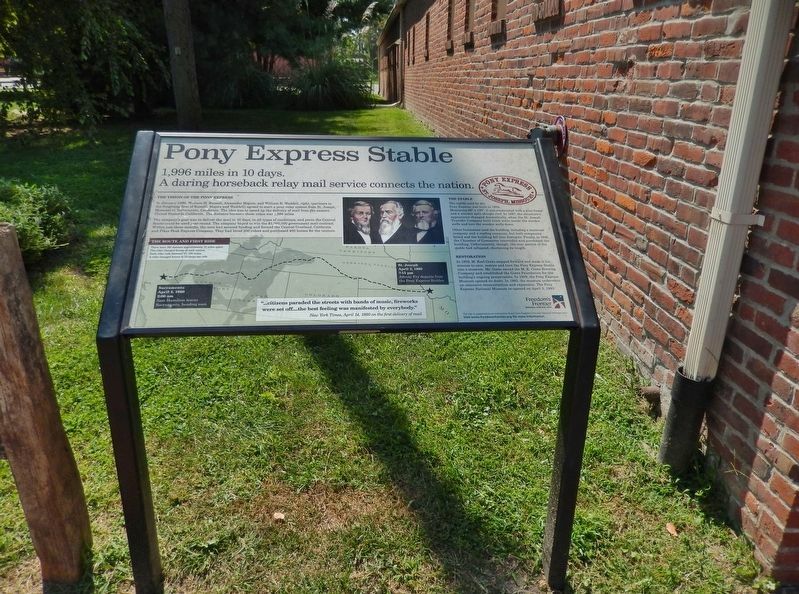 This marker is included in the Pony Express National Historic Trail marker series. Location. 39° 45.372′ N, 94° 50.908′ W. Marker is in Saint Joseph, Missouri, in Buchanan County. Marker is on Penn Street west of South 10th Street, on the left when traveling west. Touch for map. Marker is located beside the sidewalk, near the northeast corner of the Pony Express National Museum, facing Penn Street. Marker is at or near this postal address: 914 Penn Street, Saint Joseph MO 64503, United States of America. Touch for directions. of this marker); Patee Park Baptist Church (about 300 feet away, measured in a direct line); The One-Room Schoolhouse (about 300 feet away); C. B. & Q. 5614 Steam Locomotive (about 300 feet away); Patee House - 1858 (approx. 0.2 miles away). Touch for a list and map of all markers in Saint Joseph. More about this marker. Marker is a large composite plaque, mounted horizontally on waist-high posts. Regarding Pony Express Stable. The former Pony Express Stable building now houses the Pony Express National Museum. More. Search the internet for Pony Express Stable. Credits. This page was last revised on September 3, 2018. This page originally submitted on August 28, 2018, by Cosmos Mariner of Cape Canaveral, Florida. This page has been viewed 48 times since then and 10 times this year. Photos: 1, 2, 3, 4, 5, 6. submitted on August 30, 2018, by Cosmos Mariner of Cape Canaveral, Florida. • Bill Pfingsten was the editor who published this page.